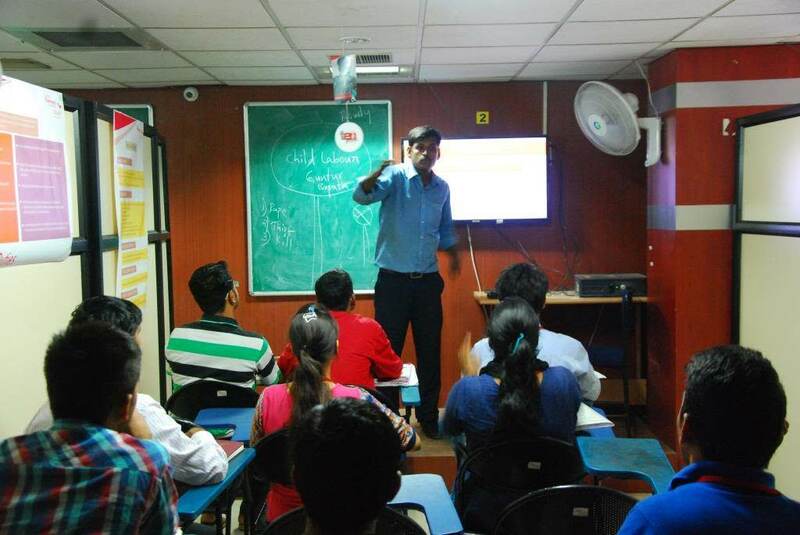 Our aim is to help Deaf people from all over India get equipped to lead independent lives. We need the support of an esteemed organization like yours to strengthen our hands so we can help many more deaf people in India. The activities of DEF include Leadership Training, Personality Development Programmes and Seminars, Interpreting Services, Sign Language Seminars and Deaf Education Methodology Seminars for Schools, HIV Awareness Workshops in urban areas, Deaf Women Empowerment, Cultural Programmes, Matrimonial Services and Counseling for family members of the Deaf. 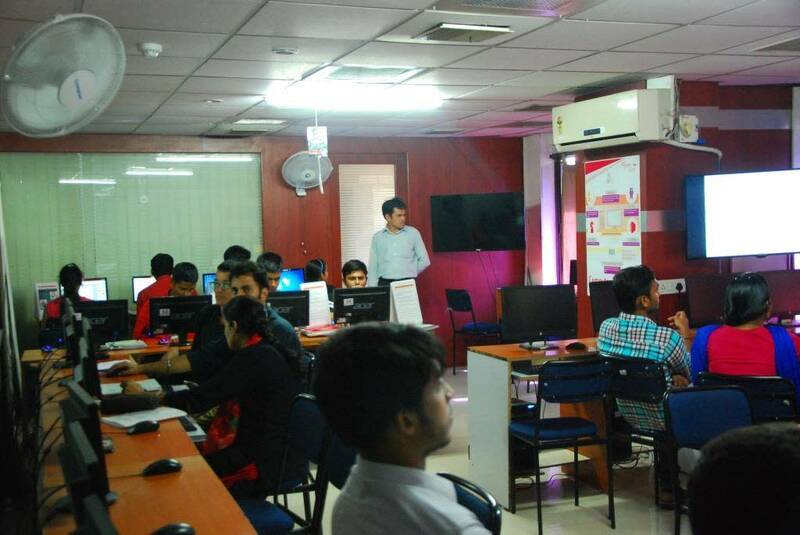 DEF- Vocational Training Program include conducting courses such as General English, Quality Computer Education, Coaching Centre for Senior Secondary and Bachelor of Commerce (Computer Application) Placement Services, Practical Life Skill Training and 3D Animation Course. 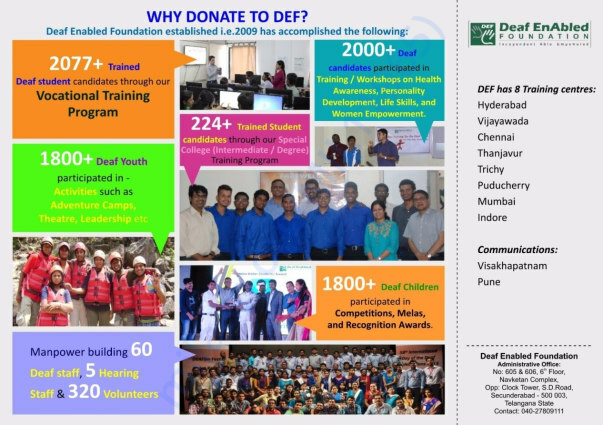 DEF has grown and expanded its reach across 9 cities namely, Hyderabad, Vijayawada, Chennai, Visakhapatnam, Thanjavur, Puducherry, Tiruchirappalli, Indore and Mumbai. Our aim is to reach as many Deaf persons as possible both in urban and rural areas. We need the support of an esteemed organization like yours to strengthen our hands so we can help many more deaf people in India. 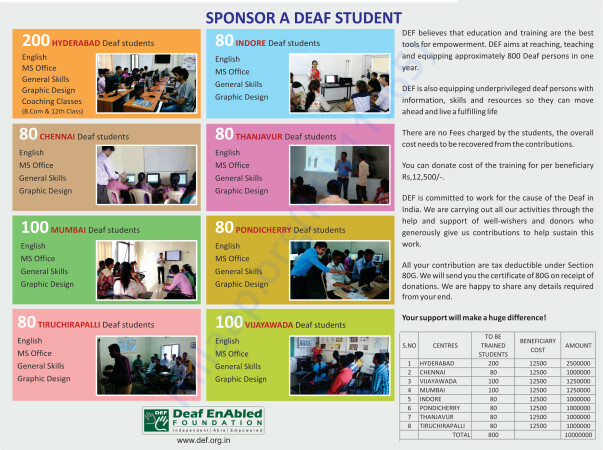 We hope you will stand with us proactively and help us to change the future of the Deaf in India for the better. Currently, DEF training 131 Students across the 8 centres, the training include English Conversational course, IT Skills and Life Skills. a)Will improve English reading, writing and communication skills . b)Operate a computer, navigating through windows and perform basic operations on word, excel and internet. We sustain our activities and educational centers through the help and support of various people and organizations. We depend on our donors to help us carry on the activities that are helping us to reach out and change the lives of so many Deaf persons for good. Thanks to Milaap and your support we got covered on yourstory.com and The Better India. We are also celebrated women's day across 7 cities.